Proper Hip tilt is key for a successful squat. 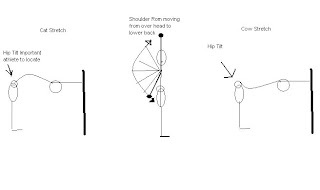 Crossfit Central addresses the hip tilt in every warm-up with tilting the hips forwards and backwards to create "hip tilt awareness". Many younger and older athletes do not have control (awareness) of their hips and fail to engage lumbar curve. Using a pvc pipe and arching the lower back(pictured above) most athletes quickly realize the positioning of the hips and have instant awareness.